Modi rapidly expanded same welfare schemes he had called a leading symbol of India’s economic underachievement under the Congress. In 2014, the Modi wave was spreading all over the country. In remote Bihar, where for decades the lights barely flickered, villagers spoke with awe of how Modi turned the power on twenty-four hours a day in industrial Gujarat. Modi continued to downplay his old anti-Muslim diatribes in favour of more subtle digs at other leaders as too pro-Muslim, and his campaign was all about development, built around his Gujarat success story. Ever since the BJP lost the last national election in 2009, Modi had been working towards this breakthrough. No Indian campaign had ever been so carefully calculated, so far in advance. Modi assembled the financing, the team of high-powered PR advisers, the media muscle to make a national name for himself and spread his promise of ‘Achhe Din’, Good Days Ahead. The power of modern communication tools is magnified, for better or worse, by scale in India, where the mobile Internet leaps the mud roads to spread the word to tens, hundreds of millions. Since the election of 2009, the share of Indians who own a TV set had risen from 53 to 63 per cent, the number using the Internet had risen from 69 to 213 million, the number with smartphones from 3 to 70 million. Membership on Facebook was up from 10 to 100 million, on YouTube from 5 to 60 million. Modi was by far the most visible political figure on all these platforms and a pioneer on WhatsApp, the platform that would come to dominate future elections, and more. Over the course of this campaign, Modi dispatched a life-size hologram of himself to address 1500 rallies and 15 million voters around the country. Modi appeared to be personally addressing so many rallies that voters wondered if there was more than one of him, not counting the holograms. Another slogan captured the ambition, and the reality: ‘Har Har Modi, Ghar Ghar Modi!’ Hail Hail Modi, In Every Home Modi! We were told the BJP had mobilized thousands of Gujaratis, including many expats flown in from the United States, to travel the country by train and spread the good word about Modi’s impact on his home state. 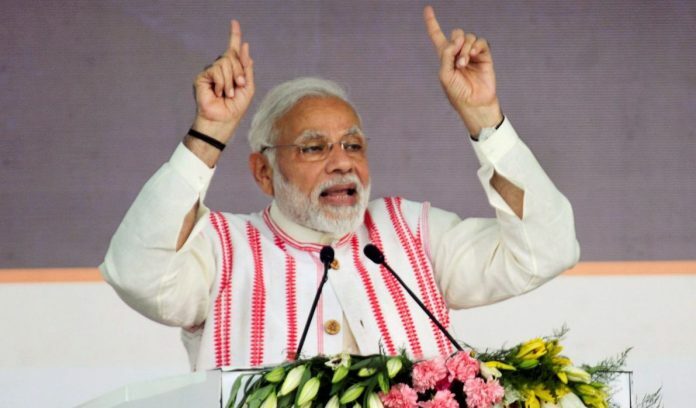 Asked which candidate they supported, a group of young people in one small town, about 20 kilometres outside Patna, responded with a chant that had gone viral on Facebook and Twitter: ‘Ab ki bar, Modi sarkar!’ This time, Modi’s government! Asked why, a kid in his late teens, wearing jeans, a T-shirt and sunglasses, said, ‘Look at what he has done in Gujarat, it has become an international model!’ A voice in the pack shot back, ‘How would you know? You haven’t even been to Patna!’ They all laughed and started chanting again: This time, Modi’s government! Priyanka Gandhi had once made the case to us that the poor communicate at a level that ‘we’, the literate and privileged, don’t understand. Perhaps it was this subaltern frequency that transmitted the Modi story from the smartphone elite and the TV-watching middle class to the rest of the 800 million Indian voters. One way or another, Modi was entering a league of his own as an object of cult worship. In 2017, Modi was no longer the man who just three years earlier had promised a clear break with India’s socialist traditions, campaigning on a promise of ‘minimum government, maximum governance’—a streamlined administration that would not interfere in the private sector. He had talked about attracting multinationals with tax breaks, privatizing state companies and making it easier for businesses to acquire land. He had ridiculed the welfare populism practised by Prime Minister Manmohan Singh, saying that the Congress’s big spending was both a source of India’s double-digit inflation and an insult to the poor, who want ‘jobs not handouts’. Like many observers from Mumbai to New York, I thought Modi had a chance to be the Ronald Reagan of India—a transformational leader who could reshape popular thinking about the value of big government. By 2017, Modi had belied those hopes. One top American diplomat who met him around this time described Modi as ‘a performer, not a reformer’, and by performer he did not mean showman, he meant micromanager, focused on executing fixes to one problem at a time rather than reducing the overbearing role of the government in the economy. Instead of further decentralizing the national bureaucracy and freeing the states to run themselves, Modi was by all accounts exerting total control over his ministers and running the most centralized administration India had seen since at least the days of Indira Gandhi, demanding that all decisions be cleared by him and the expanding staff of the prime minister’s office. His control over information remained firm, and he had yet to hold a single press conference as prime minister. Modi was rapidly expanding the same welfare schemes, including the rural employment guarantees, he had called a leading symbol of India’s economic underachievement under the Congress party. He began to emphasize more and more his own backward caste roots, presenting himself as a born ally of the poor. Tapping into India’s fundamentally socialist DNA, Modi spoke of providing loan waivers to farmers, giving out free cylinders of gas, cleansing the system of corruption and the streets of filth. He had also begun to show a fundamentally socialist willingness to use the levers of state power to control the economy. The most dramatic example came on the evening of 8 November 2016 when he announced that in a few hours, at the stroke of midnight, India would immediately withdraw all large-denomination rupee notes—86 per cent of the currency in circulation. Advertised as a way to force wealthy tax dodgers to turn in their ‘black money’ and catch them unawares, this ‘demonetization’ scheme also threw the lives of poor savers into chaos. When Modi first came to power, he seemed less beholden to the internecine caste struggles of his home state, better positioned to sell transformative reform to the nation as a whole, more capable of reforming India’s dysfunctional state. But this overnight decree banning big bills exposed Modi as, at heart, another statist Indian politician. I was reminded that as chief minister in Gujarat he had not in fact privatized any major state-owned company. Instead, he installed handpicked CEOs, closely monitoring their performance and relying on his own intimidatingly clean reputation to make state companies run more honestly and efficiently. 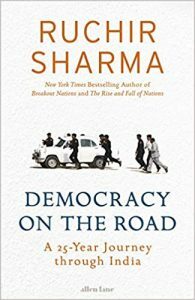 This excerpt was taken with permission from the book ‘Democracy on the Road’ by Ruchir Sharma. It was published by Penguin Random House.